Our relationship with JD Fashion PLC (the company who own Millets) originates back to 2007 when we helped to onboard JD with eBay. More recently, in 2014 we helped to integrate BANK with the marketplace before they sold their business to Hillco. Millets are the UK’s leading retailer of outdoor clothing, footwear and equipment. With over 90 UK stores, they have a significant online and offline presence. 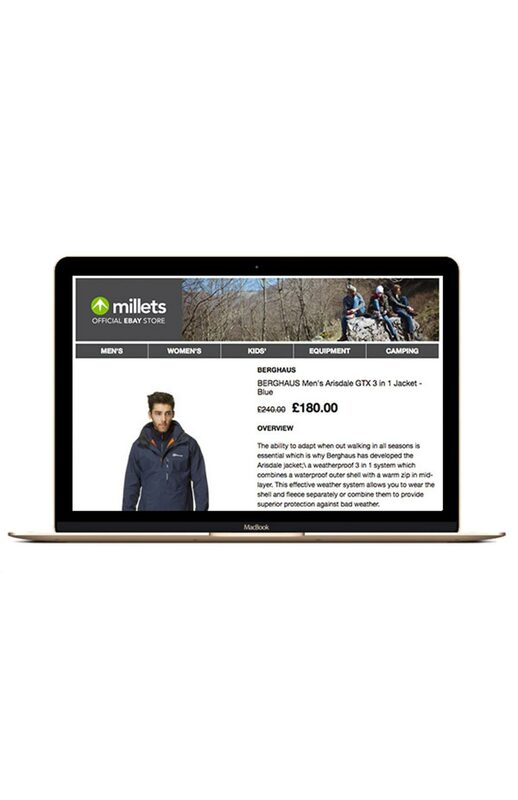 Millets came to us wanting to increase their reach to new clients via eBay and Amazon. Internally they operate using a complex warehousing, stock management and merchandising ERP. With this in mind it was clear to us that routes such as Channel Advisor and Volo wouldn’t be adequate for them. That’s where ctrlback.io comes into play. ctrlback is our own multi-faceted marketplace platform that is aimed at larger retailers who have a complex set of requirements for integrating with marketplaces. It takes in stock feeds, digests them and then turns them into fully optimised eBay and Amazon listings. It also does the really smart stuff like data mapping, order management and stock level synchronisation. It’s pretty much a one-stop-shop, so it’s no surprise that Millets love it! Using ctrlback, they have seen fantastic results on their eBay store.